More than 1.2 million men in Canada have prostate cancer and 80 per cent of them don’t know it. 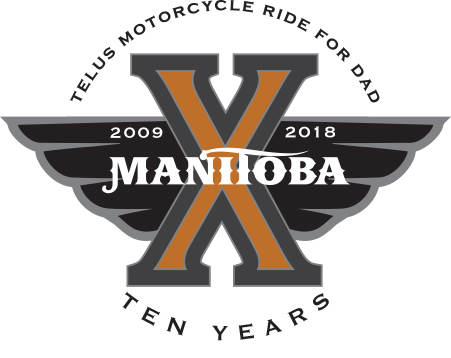 The TELUS Manitoba Motorcycle Ride for Dad (MRFD) continues to fight prostate cancer and is celebrating 10 YEARS in 2018. The Manitoba Motorcycle Ride for Dad has raised over $1.85M in the past nine years and with the help of Riders and pledge donors will surpass $2M this year. All proceeds stay in Manitoba for prostate cancer research and education. WINNIPEG, MB: Maurice (Moe) Sabourin, President, Winnipeg Police Association (WPA), is pleased to announce proceeds from the 2017 WPA Charity Ball totalling $40,000 have been donated to the Children’s Hospital Foundation of Manitoba. WINNIPEG, MB: An arbitration process has confirmed the Winnipeg Police Service (WPS) is providing its members insufficient respiratory protection from exposure to synthetic opiates such as fentanyl and carfentanil. In late 2016 and through 2017, as the fentanyl crisis exploded in Winnipeg, the WPS issued members with N95-type face masks for use in incidents where they might be exposed to airborne or powdered forms of these dangerous synthetic opiates. The Winnipeg Police Association (WPA) raised concerns the N95 masks were not sufficient for the realities members face in performing their duty on the streets of Winnipeg. An arbitrator has agreed with these concerns and ordered the WPS address these concerns properly. Another serious incident involving an off-duty member of the Winnipeg Police Service (WPS) outside of the downtown WPS headquarters highlights the continued risks faced by Winnipeg Police Association (WPA) members by a lack of secure parking at WPS facilities. Inaction by WPS leadership, Mayor Brian Bowman and City Council has prompted the WPA to write to the Provincial Government about the situation. Moe Sabourin and George VanMackelbergh present Ryan Malec and Aaron Wall of Westend Biz with over 200 gifts donated by the Winnipeg Police Association. Sons of Italy in conjunction with the Westend Biz will distribute the gifts at this year's Christmas Eve Feast for those in the community who are less fortunate. WINNIPEG, MB: The budget presented today by Winnipeg Mayor, Brian Bowman, will leave the Winnipeg Police Service short-handed yet again, with Winnipeg citizens looking at longer wait times for police calls and investigations. Honoured to partner up with the Honourable Heather Stefanson for our Cool 2B Kind campaign. WINNIPEG, MB: Today, at Lord Roberts School, in front of over 300 students and educators, George Van Mackelbergh, Vice President, Winnipeg Police Association (WPA) launched the 2017-2018 Cool 2Be Kind campaign. This is the 6th year of the anti-bullying-positive behaviour initiative. WINNIPEG, MB – AUGUST 22, 2017: Community support units are being redeployed as the members of the Winnipeg Police Association (WPA) continue to grapple with rising crime in Winnipeg. This sustained pressure on frontline members continues trends seen last year and sustained throughout 2017, said WPA President Maurice (Moe) Sabourin. WINNIPEG, MB - JULY 25, 2017: A 20 per-cent increase in the violent crime severity index in Winnipeg comes as no surprise to the members of the Winnipeg Police Association (WPA) as budget pressures restrict the amount of time members can spend on patrol, said WPA President, Maurice (Moe) Sabourin.